With the World War I centennial upon us, library staff have been hard at work digitizing the collections of Hoosier heroes of all walks of life from wartime. While we are taking the time to highlight collections of those who served both at home and abroad, here are two new additions from the past few months: S0091 Joe Rand Beckett Collection and L359 Franklin Newton Taylor Collection. 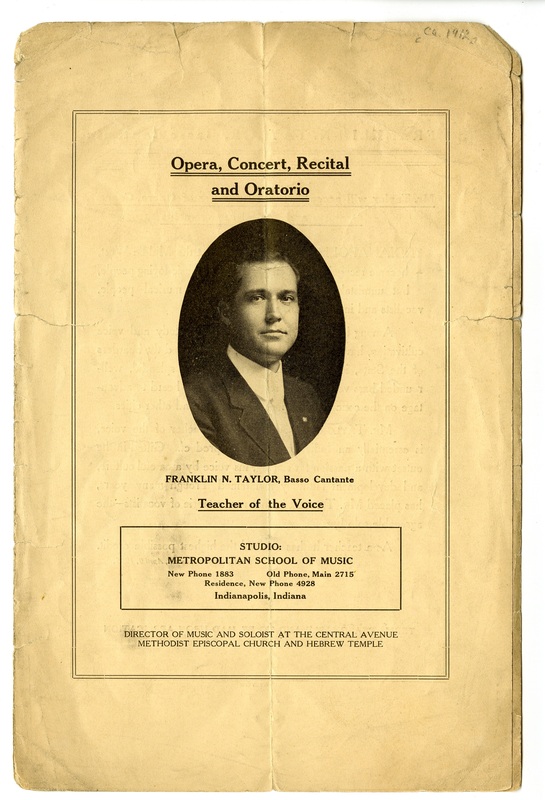 A 1912 advertisement for Franklin N. Taylor as a voice teacher at the Metropolitan School of Music. Both men were from Indianapolis, though Taylor was originally born in Danville, Ind. Taylor was a singer and, as part of the Y.M.C.A., traveled France entertaining the troops mostly throughout the Bordeaux region. Aside from his war work, he served as music director at the Central Avenue Methodist Episcopal Church, choir director at Irvington Methodist Episcopal Church and was a voice instructor at Metropolitan School of Music (later Arthur Jordan Conservatory of Music at Butler University) from 1908 until 1949. His collection includes a plethora of personal correspondence and newspaper clippings, as well as Y.M.C.A. and World War I travel ephemera and interesting personal effects that he collected. 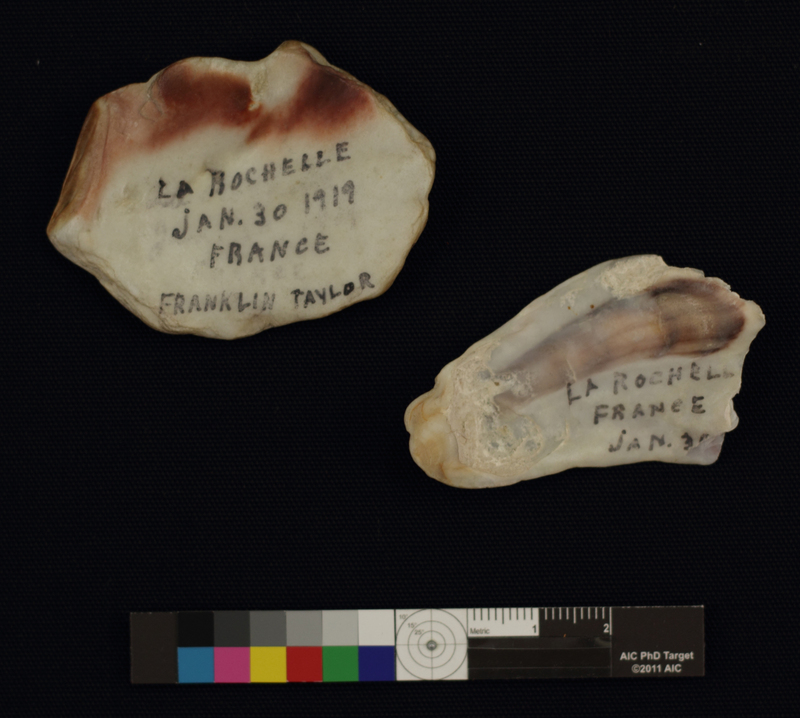 Seashells collected by Franklin Taylor in La Rochelle, France while overseas with the Y.M.C.A., dated Jan. 30, 1919. Beckett was an Indianapolis architect, lawyer, philanthropist, member of the Indiana Senate and captain of the 326th Field Artillery, Battery D during World War I. Shortly before the war, he had passed the bar and formed the law firm, Beckett and Beckett, with his father. At the beginning of his service, Beckett’s rank was first lieutenant and rose to captain in August 1918. The battery sailed from New York to Scotland the following month, arriving in France at the end of September only a few weeks out from Armistice. His senatorial career took place during 1929 and 1931; afterwards he became known for pioneering low-income housing in Indianapolis, specifically Lockefield Gardens. 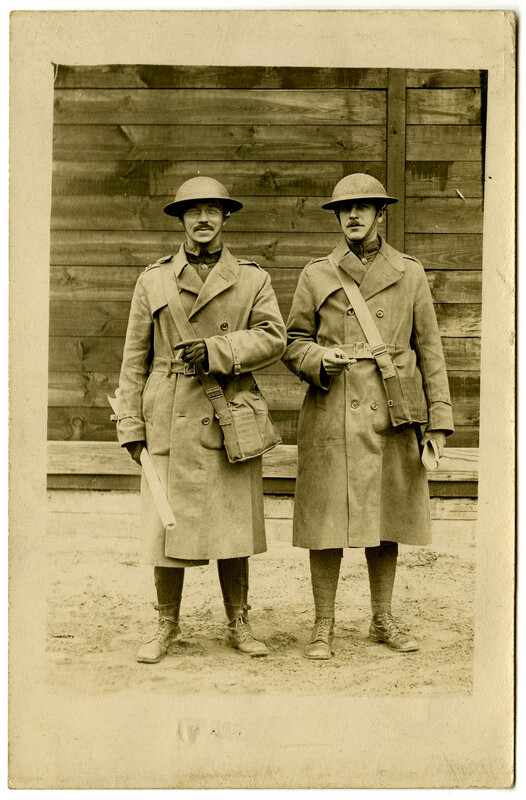 His collection contains several photographs, correspondence during and after the war and military papers, including the roster and movements of 326th F.A., Battery D.
A photograph of Joe Rand Beckett (right) in uniform in 1918; location unknown. 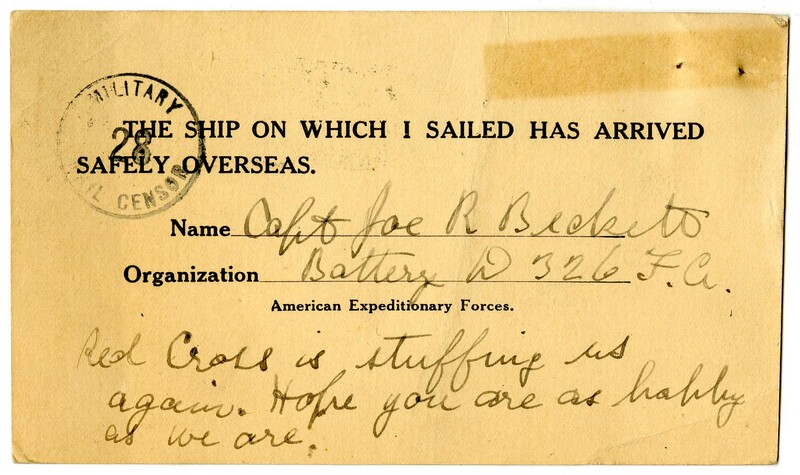 This postcard was sent to Captain Joe Rand Beckett’s wife, Mary Ann Beckett, to notify her that he had arrived safely overseas; ca. September 1918. “Joe Rand Beckett.” Indiana Legislator Database. Accessed Sept. 1, 2017. Barrow, Robert G. “The Local Origins of New Deal Housing Project The Case of Lockefield Gardens in Indianapolis.” Indiana Magazine of History 103, no. 2 (2007): 125-151, accessed Sept. 1, 2017.